Gasa Hot Spring Trek is an easy trip in Bhutan, which is suitable for the family trek. The trek covers the Thimpu and Paro sightseeing as you start the trip. You have both opportunity to walk on a countryside of Bhutan, explore the hidden communities and experience their cultural practices. Bhutan is a country of various Buddhist culture and you can feel the wonderful hospitality of the Bhutanese during this trek. Before starting the Gasa Hot Spring Trek, you take a sightseeing tour in Thimpu and explore the Memorial Chorten, Tashichho Dzong, National Library, Art School, Traditional Medicine Institute, Handicrafts Emporium and Textile and Folk heritage Museum. Then the trek leads you to Punakha. During this trip, you cross the Dochula Pass (3100m) and enjoy the side trip to visit Punakha Dzong, built in 1637. Trek to Damji goes through the semi-tropical forest of orchids. Gasa is a famous hot spring place, where thousands of travellers from different part of Bhutan itself and the foreigners visit every year. At Tashithang, the lush vegetation entice you and also some fauna species. While retracing to Thimpu, you can visit the Punakha Dzong and some other historical Dzongs in Bhutan. Then the drive takes you to Paro, make a sightseeing in Paro and fly further to your destination. To organize the Gasa Hot Spring trek, please, feel free to contact Himalayan Joy Adventure company and get perfect services and feel the expert arrangement. At Paro airport you will be picked up by Bhutan Travel representative and transfer to Thimphu. Overnight in hotel. After breakfast you will visit to Memorial Chorten (third King's memorial stupa), Painting School, Tashichho Dzong (capital of Bhutan)Traditional Medicine Institute, Handicrafts Emporium and Folk Heritage Museum in Kawajangsa. Overnight in Hotel. You will drive to Punakha through the Dochula pass (3,100m), past magnificent forests of rhododendron and magnolia. 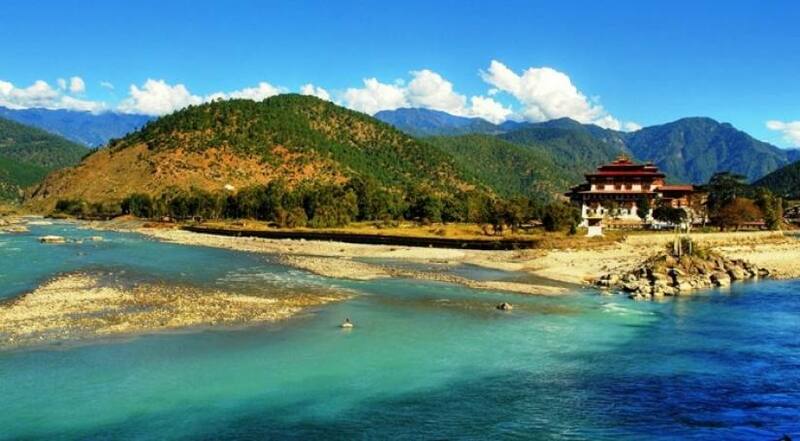 On the clear days, you can have the panoramic view of eastern Himalayan peaks meanwhile, you will enjoy the view of Punakha Dzong, was built in 1637 during the time of Shabdrung Ngawang Namgyal. The Dzong is now used as the winter residence of monk body and administrative centre of the district. After lunch drive on to Tashithang following Mo Chhu River. Camp at Tashithang 1,600m. Overnight in tent. Your day will start by the riverside, following a well-made path through semi tropical forest. There are plentiful wild orchids For flower lovers. The trail is fairly slightly climbing up to Damji village 2,250m. After lunch, you will continue walking through sub-tropical forests and villages up to Gasa hot spring. The hots pring is a famous place where local people come to take a bath from throughout country, due to its curative powers. You will ascend up to the Dzong in the evening. Overnight in Tent. You can spend either in the hot spring or take a pack lunch and climb about two hours to visit Gasa village and the Dzong. Overnight in Tent. After a short climbing, the trail winds through the rolling hills and passes through the forest of pine and oak, villages and wheat fields. You will have a beautiful view of the Gasa Dzong glued to the valley wall seeming to float in space. Overnight in Tent. The trail descends through the high agricultural benches above the Mochu River into a lush semi-tropical gorge filled with banana trees, creepers and variety of vegetation. You will also see monkeys and few other animals occasionally. Arrive at Tashithnag1700m. Your car will be waiting here to transfer to Punakha. Overnight in Hotel. After breakfast you will drive to Paro and check into your room. Then hike to the Tiger's Nest Monastery. The hike is about 3 hours to the Monastery. It is said that 8th century spiritual master (Guru Rimpoche) meditated in the cave for three months. Hike back to Paro in the evening. Evening stroll freely in Paro town. Overnight in Hotel . The Bhutan travel representative will drop at the Paro airport.